For a trade show to be termed as a complete success, the rate of attracting attendees to your booth is directly proportional to the triumph. Whilst that may sound like a simple breakdown of trade show marketing the road to a successful trade show is in essence a special blend of hard work, dedication, patience and, most of all, the tactical approach which can lead you to attract attention at trade shows. Although your success rate at trade shows will be based on a combination of elements like pre-show marketing, in-booth trade show marketing and the quality and innovation of your product, the road to accomplishing a higher rate of traffic at a trade show mainly depends upon your in-booth trade show marketing tactics. When it comes attracting attention at trade shows using audio video technology tops the chart for attracting the audience you want. We’ll now give you some suggestions on how to use AV technology to attract a crowd and some on-booth trade show marketing tactics. 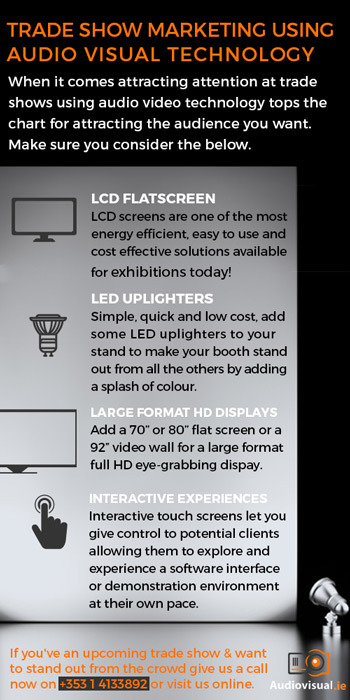 LCD screens are one of the most energy efficient, easy to use and cost effective solutions available for exhibitions today. High definition LCD’s provide vivid picture quality in even the brightest areas, ideal for trade show marketing. Display images, charts, presentations, web pages video; and attract good traffic to your trade show booth! Simple, quick and low cost, add some LED uplighters to your stand. Make your booth stand out from all the others by adding a splash of colour. Maybe your corporate colours or a nice corporate blue wash across your stand? A winner every time! Add a 70” or 80” flat screen or a 92” video wall for a large format full HD eye-grabbing display. We live in an era so advanced that the technological prosperity we experience nowadays seems utterly impossible if we don’t get to see it with our very own eyes. You can allow the audience to interrelate themselves into interactive sessions for a better and thorough insight of what you ought to deliver. Interactive flat screens let you exhibit presentations, software and live experiences whilst at the same time giving control to potential clients allowing them to explore and experience a software interface or demonstration environment at their own pace. A live demonstration is the single most popular attraction at a trade show and a marketing tactic that shouldn’t be overlooked. We all love to stop and watch an expert at work. Whether it is a live make-up demo, hair styling or cooking up a storm in the kitchen, a demo will pull potential customers from the woodwork. Granted, demonstrations are typically suited to larger booths/stands but some of the following kit can fit on every stand size. HD flatscreen displays with an overhead camera for a live video stream or some close-up shots and wireless headset microphones for hands free demos with wireless handheld mics for audience Q&A. A quick and easy AV set up that can help make a big impact. If you’re planning to setup a booth in a trade show for your organization as we have almost 50 years of experience in trade show marketing we can help you make it a success. We know exactly how to setup your trade show booth to make it the center of attraction in any trade show. Just leave a comment below and let us know how you are planning to setup a booth and we will guide you about how you can make it a success. If you need more info, give me a call on: +353 1 4133892, email me directly at: ivan@audiovisual.ie or contact us online.